In the land of glittering things we are invited to the garden of Swarovski Crystals of Austria. Where a mirror pool glistens illuminated by a series of crystal clouds that add musical orientation to the experience. There are displays of art, expression and statement in the larger than life sized representation that inhabit this garden of expansiveness. Situated near the sculpted children’s play area is the design by André Heller of a labyrinth of great size in hedge foliage that depicts the hand. At its center is a heart that one spirals into in the walk. The gardens are full of artistic statements and sometimes when we want to get a point across, the best thing to do is to exaggerate to inspire action. This labyrinth design gives us great entertainment as well and opens a broader perspective of what we hold in the palm of our hand and how we might hold it. 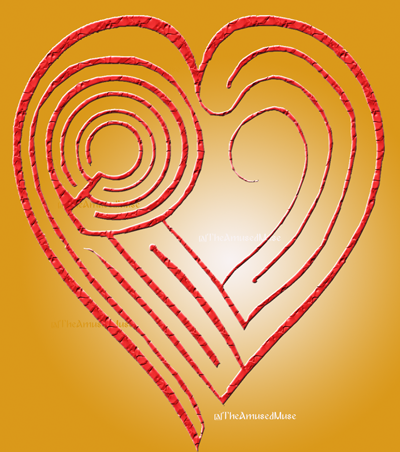 Note: The original schematic of this design indicated a labyrinth heart at its center, though this design, while quite interesting is more maze than labyrinth even though Austria calls it a labyrinth. Explore what you hold in the palm of your hand and how you hold it today in your walk. Art is found in the heart, expressed from the soul and displayed in a variety of forms. The labyrinth becomes a truth of tapestry for those who dabble in its design. For some it is merely for the drafting of an outline for an expedient finger walk and for others, it is the walk of inner creativity, of strokes and pathways leading us to an appreciable pivotal experience. The lines and movement converge in the walk to relax and reduce what is unnecessary and deliver a reliable conscientious experience that is what honesty is all about. This design began of two minds and ended with two ways to walk, perhaps to rise or soften each side independently. Where I am seeing heart evidence in my walk and walk of life, it is interesting that the past few days have also included drawing and designing ideas of the heART too. After a walk weighing the duality of many things, some of which were merging and others offered a harmony of differences. One labyrinth in art brought them both together. Discover the way of your heart and what it leans toward today that is creative or heART centered. Find evidence and truth in your walk and reflections of hearts in your day that symbolize your truth.